Hummus is a traditional Levantine dip that is enjoyed around the world. Made with chickpeas and tahini, a sesame seed paste, hummus is a good source of protein and, despite its deceptively creamy consistency, is normally a vegan-friendly snack. Although hummus is widely available in supermarkets and delis, making it at home is so easy and so worthwhile. 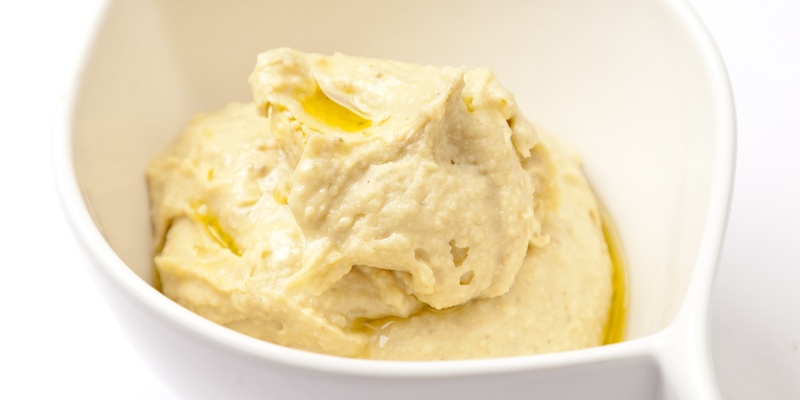 Bryan Webb’s quick and simple hummus recipe takes just ten minutes to prepare and is perfect with toasted pitta bread, or try chopping up some crudites to dip into Shaun Rankin’s paprika-spiced hummus. Once you’ve got to grips with hummus, don’t confine it to dip status forever - Marcus Wareing slathers hummus over his irresistible cheeseburger, while Bryan Webb marries traditional flavours perfectly in his Welsh lamb cutlets with halloumi and hummus recipe.